A New Initiative to be More Eco-Friendly! ~ The Toronto Hare Krishna Temple! A New Initiative to be More Eco-Friendly! As many of our regular temple-goers know, the temple decided last year to begin using steel plates during our weekly Sunday Feasts to reduce the amount of disposable plates used by our community. At that time, a special committee was formed at the temple to make recommendations about new environmentally-friendly initiatives that our community can undertake. 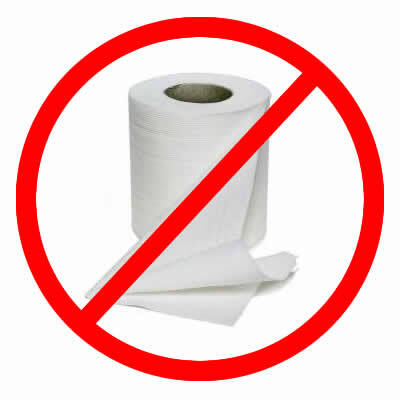 The Hare Krishna temple would like to announce that, in an effort to reduce our temple's eco-footprint (and also to go to a more Vedic way of hygiene), we will no longer have toilet paper in the temple washrooms. We encourage people to use water for personal cleansing after using the washroom. According to environmental statistics, the average person will use a total of 20,805 sheets per year! That is quite the burden on the environment. We hope that this humble effort will do it's part to reduce that impact. While the Hare Krishna temple acknowledges that this may be an unpopular decision at first (similar to our switch to the use of steel plates), we hope our community will support this effort to help the environment. To allow for an adjustment period, devotees will be allowed to bring their own toilet paper from home to the temple for the next 90 days as a grace period. If you have any questions and/or concerns, please feel free to let us know. You had me going there. I just read the first few paragraphs and was like, No Way!! lol, now that was a good one! LOL!!! Well, luckily devotees in Toronto have not been buzzing about toilet paper. This was all us! LOL! I printed up your blog post as a temple announcement today and put in the devotees mailboxes in the neighborhood. Hilarious... especially the part about the grace period.. devotees bringing their own toilet paper? gotta be a joke. Glad you enjoyed the prank! As you can see, we certainly feel that humour has a place in Krsna consciousness! http://iskcondallas.blogspot.com/2014/04/breaking-news-statue-of-nirakara.html?spref=fb Breaking News!! Statue of Nirākāra Brahman was stolen from the temple!